How to zoom in YouTube Videos with this free Tool in your web browser? /Browser extension /How to zoom in YouTube Videos with this free Tool in your web browser? 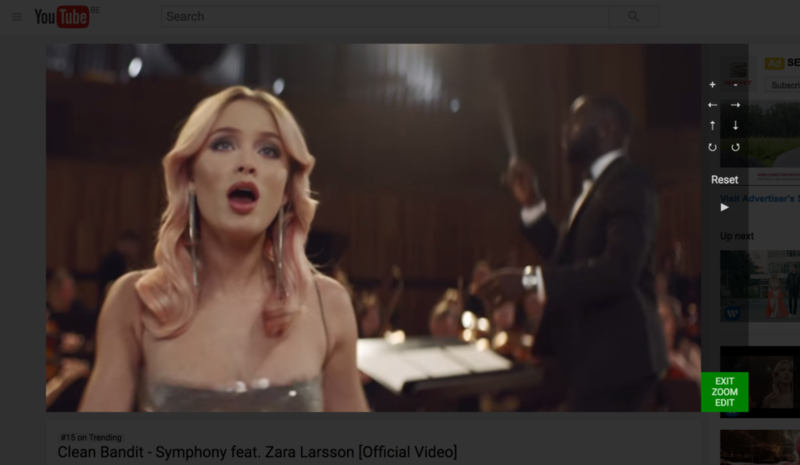 How to zoom in YouTube Videos with this free Tool in your web browser? You can with this nifty tool, it works on all the HTML5 video players on the web. When you open a web page with a video player inside, you must move your on the video player to get this side panel visible. In this Zoom panel, you can zoom in and out, move to the left, move to the right, move up and move down, Rotate to left and rotate to right. And a button to reset this scale and position to the original settings. How to zoom in YouTube Videos? In the latest Turn Off the Lights Browser extension v3.4.1.0 you can zoom in and out the video player. Such as on YouTube, Vimeo, Dailymotion, Youku etc. You see a context menu show up and select the Options menu item. The Turn Off the Lights Options page shows up, and in the left sidebar choose “Advanced Options”. On that tab page enable the “Video Toolbar” checkbox and also the “Video Zoom” checkbox. Open now a YouTube video, when you move your mouse over the video player you see it add the Zoom panel on your right side. To get this Zoom feature, Turn Off the Lights Browser extension v3.4.1.0 or higher must be installed on your web browser. You can download it from the Turn Off the Lights official website.